Rachel Wilson was born on 19 Dec 1894 to a wealthy Quaker family in Kidderminster. After the outbreak of the First World War, she trained as a nurse and eventually joined the Queen Alexandra Hospital run by the Friends’ Ambulance Unit (FAU) in Dunkirk in 1917. She became a close friend of Molly Evans. There are a number of mentions of ‘Wilson’ in Molly’s war time diaries. She appears in the photo of helmeted nurses alongside Molly and Elizabeth Hardy taken some time in 1918. Two other nurses in the photo are Mary Cecilia Pease and Elizabeth Frances Pease – both Rachel’s cousins. Rachel’s mother was a member of the Quaker Pease family from Darlington. The worst period recorded by both Molly and Rachel were the days of 20-23 Mar 1918 when the raids from the air, from the sea and from long range guns intensified. This led to the emergency evacuation of the hospital from Malo in the North East of Dunkirk to Petite Synthe out to the South West of the town. Both Rachel and Molly returned to Birmingham after the war and got married within a month of each other. Rachel married Paul Strangman Cadbury on 24 Jun 1919. He was a fellow Quaker who had served in the FAU and went on to become Chairman of the famous family chocolate business. Molly married Noel Downing on 29 Jul 1919. Both the Cadbury and Downing families grew up in Edgbaston. 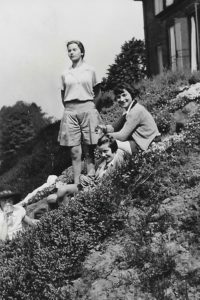 Catherine Rachel Cadbury was born in May 1920 and Pamela Downing on 16 Jul 1920. Molly’s diaries continue to record some social contact throughout the 1920’s and 1930’s, especially when the children were very young. The Cadbury’s second child Edward Paul Cadbury was born on 10 Nov 1921 and Hazel Mary Downing was born on 24 Dec 1922. Other social activity revolved around Tennis. Latterly there appear to have been visits by the Downings to the Cadbury’s country house in West Malvern. Molly and Noel Downing moved away from Birmingham on their retirement in 1945.